Kanegawa-no-Mori is a public park built along Kanegawa river goes through the East side of Kofu Basin, Yamanashi prefecture. 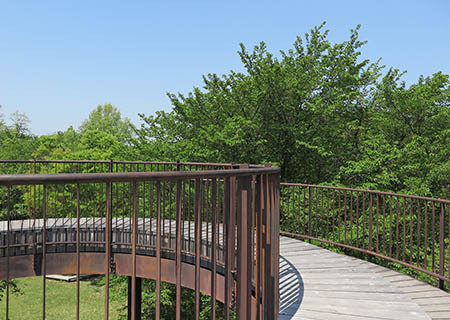 The park is called “Mori (forest)”, which is originally preserved woods designated in conservation laws as the disaster measures of river flood. These woods are semi-natural environments managed by local people as coppices for over a hundred years. 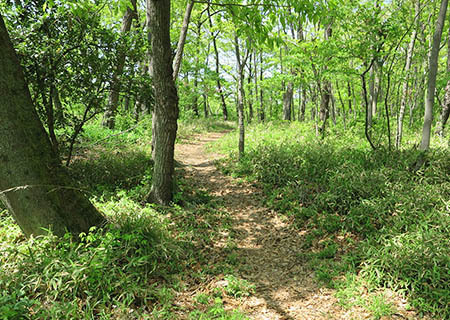 The woods consisted of several oaks, hornbeams and pine trees, which were used to be cut down every 20-30 years as fuels until gas supply began in Japan after the World War II. When the large improvement works of the river was executed, the woods lost their major system functions and were abandoned for a while. But in 1970’s, the increasing demand for holiday resorts saved 36ha of woods from development and they were revived as a park consisting of 6 woods in 1996. No matter what season, you can enjoy some parts of natural beauty. Walking along a creek, pottering under trees or picnic on sunny lawn, there is something to suit everyone. Just step in nature and find your own favorite. 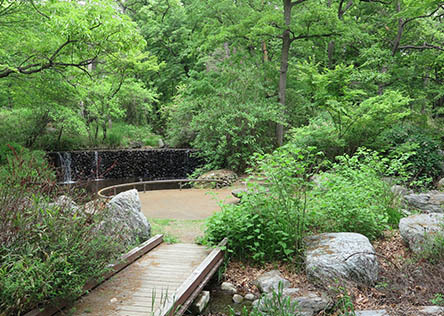 A creek from a spring flows through the wood, reach to the large pond nearby visitor center. Feeling balmy breeze, you can walk along the creek. Dongri is acorns in Japanese. You can find some kinds of oak trees in there. In spring season, you can enjoy various types of Sakura flowers (cherry blossoms) blooming from the top of the observation deck. You can spend a relaxing time in spacious lawn. Birds calling and the music of the stream make your mind and body calm. 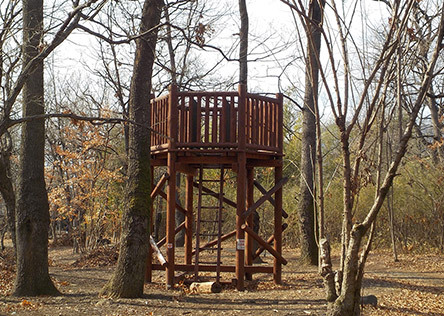 This area is best for nature observation. Early morning of summer season, you might encounter Japanese Beatles on the stems of oak trees. In middle of June, the breeding season of firefly starts. You can observe fireflies luminescence following sunset at the “Hotaruike pond(ほたる池)” Because emitting terms of fireflies fluctuates between one to two weeks every year, we recommend that you to contact visitor center and get detailed information before visit. There are two Target-bird-golf courses in this wood. Target-bird-golf is a unique sport designed by a Japanese golf fun. 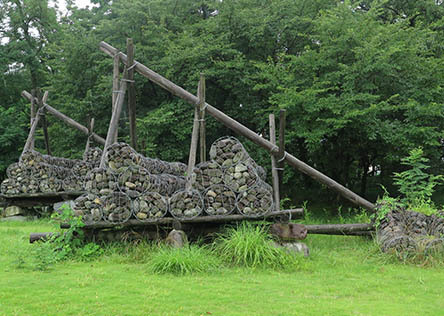 You can see some of large trigonal wooden frameworks named “Seigyu” at “Chisui hiroba (治水広場)” . The “Seiyu(聖牛) is Japanese traditional apparatus for improving the riverbed environment which was designed by Takeda Shingen about 450 years ago. There is a dog friendly field in the wood. 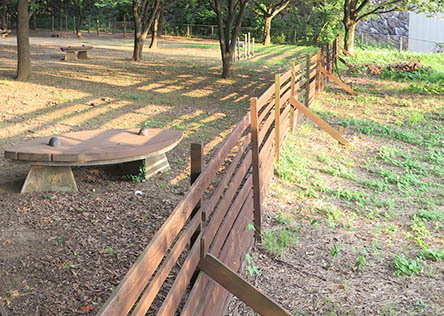 Inside the field, you can let your dog play freely without leashes. We have closed days from December – March. Please note following days. 31th December – 1st January. The nearest train station is JR Chuo Line Isawa-Onsen Station（中央線石和温泉駅）. 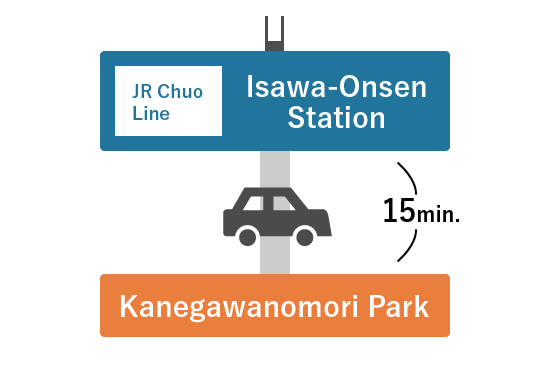 About 15 minutes by taxi from JR Chuo Line Isawa-Onsen Station to Kanegawanomori Park visitor center. 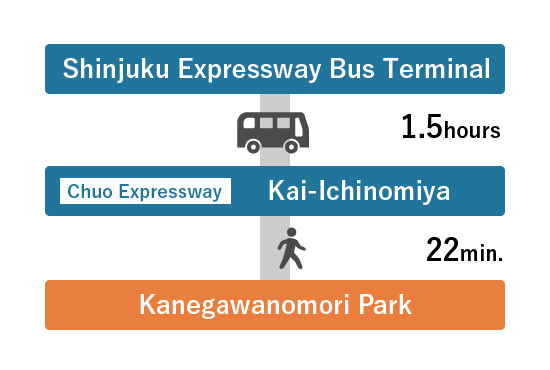 About 22minutes walk from Chuo Expressway Kai-Ichinomiya to Kanegawanomori Park visitor center. * We recommend visitors from Tokyo this route. 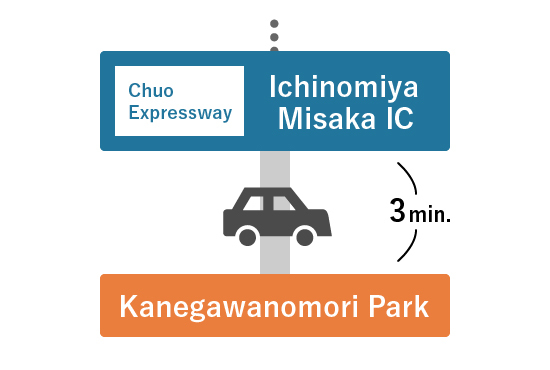 About 3minutes from Kofu Showa IC of Chuo Expressway. You can rent bicycles by the hour at the cycle stations in Dongrinomori and Sports-nomori. *Closed on the same days with visitor center. *Please return your bicycles by closing time of visitor center. Please buy required tickets from the ticket vending machine at the front of the cycling station first. You may rent bicycles exceeded the time. In that case, please pay excess charge when you return bikes to the staff. Barbecuing or Grilling is not allowed in Kanegawanomori Park, except in designated area of Dongurinomori wood. You must book BBQ sites by 4:00pm of the previous day. The capacity of a site is 6 persons. Please book required sites. EXP. 8persons need 2 BBQ sites. We have 5 BBQ sites. The booking is first come first serve based. Opened fire is not allowed, please use BBQ grill. There are no kitchen facilities in the BBQ area. Please dress all foodstuffs at your home in advance. Copyright © KANEGAWA-NO-MORI All rights reserved.